I'm a Norbyah: Lady danger? I was in town today, so I stopped in at a MAC store to try some lipstick (I love make up, have I said this before?) 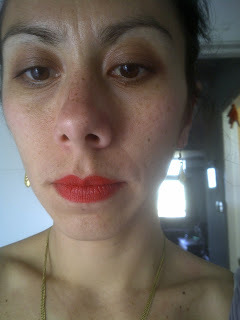 I've been on the hunt for the orangey-red color I keep seeing on the lips of women in all my blog reads. I tried two shades. The first was way too orange and my mother and mother-in-law's looks told me it was not a good color. I knew this already, but they sealed the deal. Then I tried this one. Lady danger. I think I'll go back for it. Seems like the perfect shade; not too orange at all. you totally pull it off. looks brilliant. again I say...DO IT!